Brimma Tech, Inc., a software development and technology services company, announced that it has joined the Ellie Mae Pro consulting partner program. By participating in the program, Brimma Tech will have deeper access to tools, training, marketing opportunities, and other critical resources to grow its business. Brimma Tech will help lenders and Ellie Mae accelerate the delivery, deployment, and adoption of Ellie Mae’s Encompass solution. Highest Quality Delivery – Our developers, not testers, own quality! Brimma has more than two decades of proven track record of building and implementing multiple Mortgage Origination and Management Solutions for many of the Top 10 US mortgage lenders. 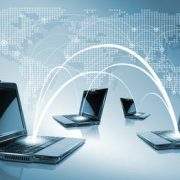 By now, most lenders can agree that there are countless benefits to integrating their Loan Origination System (LOS) with a technology provider’s software. For one, it eliminates the front-end data entry of having to visit multiple vendor websites and rekeying data they have already entered into the LOS. With a true “lights out” integration, the lender doesn’t have to ever leave the LOS; they can order everything they need within one system, saving valuable time. 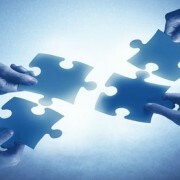 Lenders partnering with a provider that enables a true “lights out” LOS integration surely experience benefits. However, if their provider is not a middleware aggregator, they are still missing out on ways to improve their loan processing. By partnering with an aggregator, lenders can take their LOS integration a step further and distinguish themselves among competition. In most LOS integrations, a technology provider integrates into a lender’s LOS in order to enable access to their own brand of products and services. An aggregator, on the other hand, provides lenders access to all brands within one platform. Even if a lender wanted to integrate with multiple providers, the process to include all of their vendors could take months to complete. With an aggregator, lenders can go live with hundreds of vendor choices available to them on day one. Some aggregators even give lenders the ability to add their own vendors that may not be integrated with the aggregator; such as small, local title companies or appraisers. With User Defined Vendor (UDV) technology, the lender selects which vendor they would like to utilize and the aggregator delivers the order to the preferred vendor. Local vendors looking to access an aggregator’s system on the back-end can easily upload their documents to the system with data elements and the PDF so that the aggregator can convert the forms to XML and deliver them back into the LOS. UDV technology enables lenders to add their preferred companies into their LOS in days as opposed to months. Another important tool that lenders should look for when choosing an aggregator is escalation intelligence. This type of technology programs the systems to automatically know what the lender wants to do next if orders receive a “no hit” or if the underwriting guidelines dictate that a more robust type of product needs to be ordered. For example, if a lender orders an instant property valuation and there is not enough information on the property for the system to return an AVM, the system will automatically order a desktop valuation, drive-by appraisal or full appraisal, depending on the underwriting guidelines, risk tolerance and cost savings objectives of the lender. The same technology can be applied to instant title searches, full property reports and title insurance products. Finally, an aggregator has the ability to mimic the lender’s underwriting guidelines to provide additional efficiency and “automated decisioning” technology. They provide configurations that intelligently know what products to order based on credit scores, loan amounts, LTV and other underwriting criteria, then auto-order the appropriate products and services that are required for that specific loan. This type of technology eliminates the need for the processors to determine what to order and when to order it, thereby reducing the risk of human error. LOS integrations with middleware aggregators result in reduced processing and closing times for lenders. The aggregator delivers faster integrations with more vendors, manages vendor turnaround time on behalf of the lender and even calculates Loan to Value (LTV) and Combined Loan to Value (CLTV) to automatically populate on the lender’s system. While general LOS integrations are beneficial, it is clear that the most competitive lenders use middleware aggregators to take their integrations to the next level. 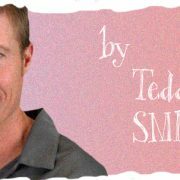 Tedd Smith is chief executive officer of Austin, Texas-based FirstClose, provider of end-to-end technology solutions to mortgage lenders nationwide. The FirstClose reporting suite is the first, comprehensive solution with capabilities to deliver title, flood, valuation and other important data elements in one report. 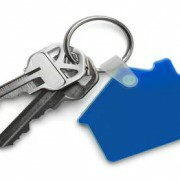 For more information, visit www.firstclose.com. According to data from Ellie Mae, time to close all loans decreased from 44 days in January to 42 days in February. 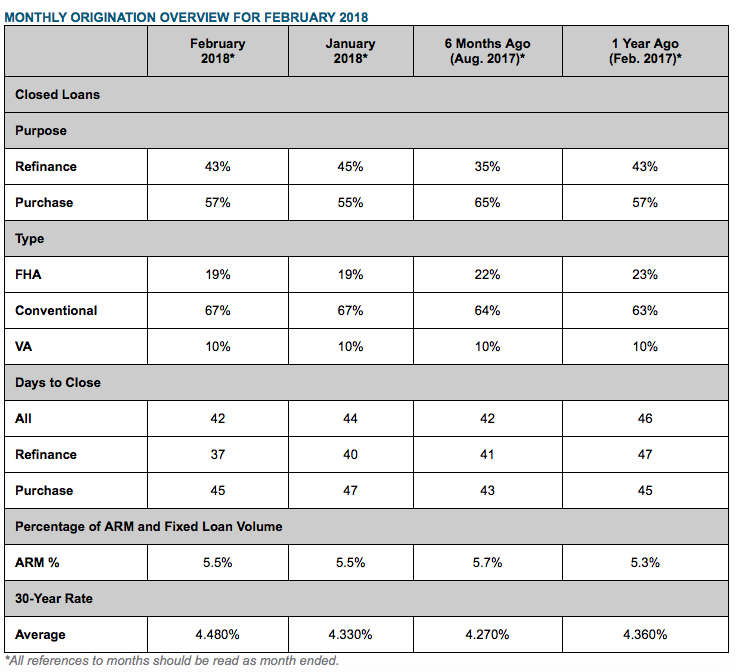 Time to close all purchase loans decreased from 47 days in January to 45 in February and time to close all refinances dropped from 40 days in January to 37 days in February. This is a significant drop from 2017 data that shows time to close all refinances was 47 days. Time to close FHA loans also decreased from 47 days in January to 43 days in February and time to close a conventional loan shrank from 43 days in January to 41 days in February. Time to close VA loans shrank from 50 days in January to 47 days in February. This comes as 30-year interest rates continue to rise from 4.330 in January to 4.480 in February, the highest rate since May of 2014. The percentage of closed ARMs held at 5.5 percent for the second month. Closing rates decreased slightly with closing rates on all loans decreasing from 70.9 percent to 70.6 percent and closing rates on refinances decreasing from 65.5 percent to 65.0 percent. Closing rates on purchases held at 75.7 percent for the second month. >>The percentage of refinances dropped from 45 percent of all closed loans in January to 43 percent of all closed loans in February. 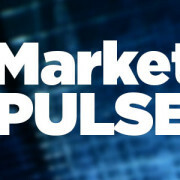 >>The percentage of purchases increased to 57 percent of total closed loans. >>The breakdown of type of loans remained the same for the second month with FHA loans representing 19 percent of closed loans, conventional loans representing 67 percent and VA loans representing 10 percent. >>Overall FICO scores held steady at 721 for the second month. LTV increased from 77 to 78 and DTI held at 26/40. For a financial institution wanting to integrate its loan origination system (LOS) with its core platform, the endeavor can be both expensive and time-consuming. The core-provided connectors and APIs typically needed to push data from the LOS to the core can devour both programming hours and dollars. Users of TCI’s LOS products have another option: EnableSoft’s Foxtrot robotic process automation (RPA) software. A Foxtrot-powered data push can be set up in a matter of hours rather than the weeks or months it can take working with a core-provided solution. Foxtrot can also be used in both real-time and batch environments. Finally, Foxtrot costs substantially less than virtually all core connectors. LoyaltyExpress, a provider of marketing automation and cloud-based CRM solutions for mortgage companies and banks, announced that its LendingManager Digital Mortgage platform now seamlessly integrates with Fannie Mae Desktop Underwriter for greater efficiency with upfront data validation & eligibility. Borrowers can apply for a loan or prequalify via loan officer, branch, and/or corporate websites, which LendingManager also designs, and gain immediate time savings with this integration. LoyaltyExpress simplifies CRM and marketing automation for banks and mortgage companies, including one of the top three retail lenders in the nation. Its flagship solution, CustomerManager, is an enterprise-wide, Software-as-a-Service platform that combines lead management, email and direct mail campaigns with a 360-degree view of each loan officer’s customers, partners and prospects. The MarketingCentral service delivers a web-based, sales collateral store powered by custom content creation and integrated print fulfillment. >>NetOxygen v5.1 provides a loan overview feature to offer users a bird’s eye view of various attributes of a loan in the form of a dashboard. It also provides users the ability to look at various conditions associated with the loan and indicates the category of a condition, when a condition is due and the status of the condition. >>As part of WGS’ continued focus to expand its list of service providers, it has added several interfaces to fully integrate with Fannie Mae’s Day One Certainty and help lenders process loans in a more automated and streamlined fashion, while enabling a quicker time to close. >>NetOxygen v5.1 offers several new self-service tools to enable lenders to perform certain configuration tasks by themselves, thereby boosting operational efficiency and reducing time to market. These features include product and pricing setup, conditions configuration, configurable fee matrices and a user management tool. >>This version features a well-defined API that allows more seamless integration of third-party applications and several technology updates designed to enhance performance of operations and the user experience. >>In addition to the system’s numerous workflow feature updates, the 5.1 version integrates a combined correspondent and wholesale portal to offer a more simplified experience pertaining to the processing of loans that originate from the correspondent and wholesale channels. >>NetOxygen v5.1 Platform also supports the WGS SaaS offering which provides regional and mid- market lenders lower cost of entry, scalability and reduced time to market. NetOxygen’s SaaS offering will keep lenders up-to-date with upgrades and security patches while ensuring best-in-class system uptime. It offers a pay-as-you-go variable cost model to help lenders reap the benefits of the platform without significant upfront investments. Clients on the SaaS offering will be able to take advantage of the all the powerful features of NetOxygen including multichannel support, self-service tools, and expanding partner ecosystem. >>Finally, NetOxygen v5.1 fully complies with the latest industry regulatory changes. The expanded set of reportable fields as set out in HMDA 2018 is fully supported, and the new version incorporates changes to the format and number of fields within the HMDA Loan Application Register (LAR). This updated version is also fully compliant with the Uniform Closing Dataset (UCD) mandate, providing a common dataset for loan deliveries to Fannie Mae and Freddie Mac as part of the Consumer Financial Protection Bureau’s Closing Disclosure. Other compliance changes include Military Lending Act updates, Desktop Underwriter version 10.1 updates, a revised Cash Flow Analysis worksheet (Form 1084) and Single Housing Guaranteed Income Limits table updates. “Our innovations are designed to not only meet the regulatory and workflow demands of our valued customers, but also give them a competitive edge to fuel future growth,” said Alok Bansal, Vice President and Business Head of Wipro Gallagher Solutions. “We are very excited about our SaaS offering that will substantially improve lenders’ efficiencies and help them drive digital transformation with the NetOxygen platform,” he added. Refinances among Millennial borrowers regained their popularity in the fourth quarter of 2017, according to the latest Ellie Mae Millennial Tracker. December was the third straight month refinances accounted for 15 percent of all closed loans for Millennial borrowers – the highest percentage of refinances for this demographic since February 2017’s annual high of 17 percent. The percentage of closed purchase loans remained at 84 percent, decreasing from June 2017’s peak of 90 percent. Specifically, the percentage of Conventional refinances remained at 19 percent, holding steady since October, while FHA refinance loans stayed at six percent from the month prior. The percentage of Conventional purchase and FHA purchase loans also remained the same from November to December at 80 and 94 percent, respectively. >>The average 30-year note increased slightly from 4.18 in November to 4.22 in December, still lower than 2017’s highest monthly average of 4.34 in April. >>The average time to close all loans held at 44 days in December. >>Average time to close a refinance held at 45 days, while the time to close a purchase also remained flat at 42 days, the same since June 2017. >>Average FICO scores for all closed loans fell one point from the month prior to 722. The top Metropolitan Statistical Areas (MSAs) for Millennials by percentage of mortgage loans closed in December included Casper, Wyo. (71 percent), Williston, N.D. (63 percent), as well as Victoria, Texas and Mount Pleasant, Mich. (both 61 percent). The Ellie Mae Millennial Tracker is an interactive online tool that provides access to up-to-date demographic data about this new generation of homebuyers. It mines data from a robust sampling of approximately 80 percent of all closed mortgages dating back to 2014 that were initiated on Ellie Mae’s Encompass mortgage management solution. Searches can be tailored by borrower geography, age, gender, marital status, FICO score and amortization type. US Real Estate Services, Inc. (USRES), a provider of REO asset management, default ancillary services, and valuation solutions nationwide it is now integrated to LendingQB’s cloud-based loan origination solution (LOS) to further expand its reach and enhance the customer experience for the appraisal management service line. These enhancements position USRES for continued growth, enabling the company to expand its presence and services within the mortgage industry. With this integration, USRES can now more effectively engage Lending QB’s customers in a single, centralized environment. In addition to originating mortgages, the platform seamlessly integrates with hundreds of leading industry applications, including document preparation, compliance, mortgage insurance and title services. This addition to USRES’ set of tools and offerings further cements their commitment to providing the best, most transparent experience in the AMC space. According to STRATMOR Group’s Senior Partner Nicole Yung, mortgage technology is changing. These observations were recorded in the firm’s 2017 Technology Insight Survey (TIS). Over the past three years, the TIS has become the mortgage industry’s go-to reference for unvarnished peer views on major commercial-off-the-shelf (COTS) loan origination systems (LOSs) relating to market share, overall satisfaction, functional performance, implementation experience and more. However, as Yung explained, while still an invaluable resource for LOS intelligence, the 2017 TIS has expanded to become a broad-based mortgage technology survey. “While there have been many significant advances in mortgage technology over the years, most of were focused on improving lender processes and productivity, not on fundamentally changing the borrower’s experience,” said Yung. So, how is the mortgage technology landscape changing? “Today, we are in the midst of a technological shift that is fostering this new competitive paradigm, one that is driving how a consumer gets a mortgage and how a lender gets to the consumer. While most lenders think of DM solely in terms of the ‘how’ of customer interaction, STRATMOR’s functional view of DM extends to how a lender uses consumer/borrower data in its marketing activities. In this ‘sea-change’ environment, getting the right technology – and using it in the right ways – takes on special importance,” answered Yung. Any resource that can help lenders better understand technology is welcome in my view. PathSoftware today announced that Path, its configurable, multi-channel, cloud-based mortgage loan origination software (LOS), is now fully integrated with DocMagic, a provider of document production, automated compliance, and eMortgage services. The new web integration provides a direct, secure connection between users’ loan files and DocMagic’s family of products and services. This enables users to order, generate, manage, receive and deliver TRID-compliant documents, such as loan estimates, closing documents and disclosures, with just a few mouse clicks—virtually eliminating the chance of errors and exposure to security risks, while avoiding the time constraints of manually rekeying information. This integration also enables users to access DocMagic’s Total eClose platform, a digital mortgage solution that contains all of the components needed to facilitate a completely paperless digital closing. In addition, the integration also accesses DocMagic’s eSign technology so borrowers can electronically sign all documents in a secure, compliant manner. The PathSoftware LOS integration also gives mutual clients the option to take advantage of DocMagic’s Premium Reps & Warrants Guarantee offering. The guarantee covers high cost points and fees calculations, TRID-related audits, customer modifications of documents, document selection, and the Loan Estimate (LE) and Closing Disclosure (CD) under DocMagic’s SmartCLOSE product.